In March of 2008 we watched the Sandhill Cranes head out to breakfast at sunrise one very cold morning. They spend the nights roosting on submerged sandbars in the Platte River. 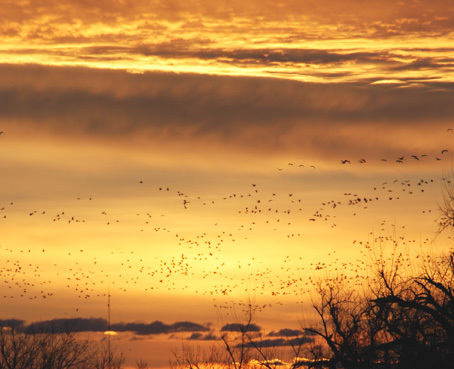 If you either live in Nebraska or are a birder, you have heard of the annual spring migration of the Sandhill Cranes. It is an incredible sight to behold – huge flocks lifting from the Platte River with the morning light, forming flight lines criss-crossing the sky, and then settling down into the surrounding fields like blankets of fog. And the noise! They have so much to talk about – comparing wintering stories, their hopes for the summer, new found aches and pains, how the kids are so different nowadays. Their unique voices combine into one loud, confusing, melodious banter. 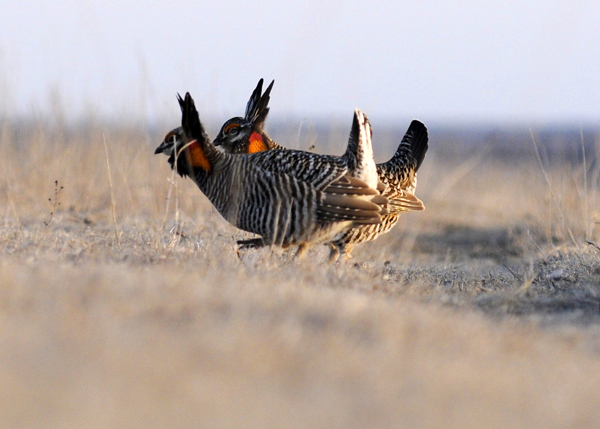 A lesser known spring spectacle is the mating dance of the Prairie Chicken. 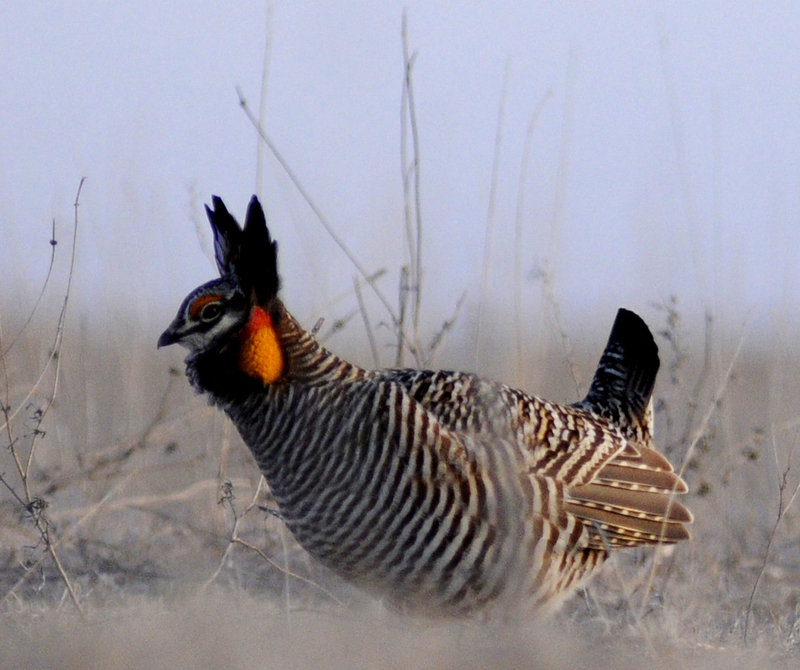 Maybe the reason fewer people know about it is because one state can not claim them as its own – the Prairie Chicken range is from northern Kansas and Colorado up through the Dakotas with a little side-step into Minnesota. Also, their story is definitely not as romantic as that of the cranes. The Sandhill Cranes winter in Texas, New Mexico, and Mexico and then all converge on the Platte for about a month to fatten up and hook up (if they have lost their mate over the winter), and then fly north to either Minnesota or the Arctic, depending on the subspecies. They’ve been covering this same route for millions of years, even before the Platte River existed. 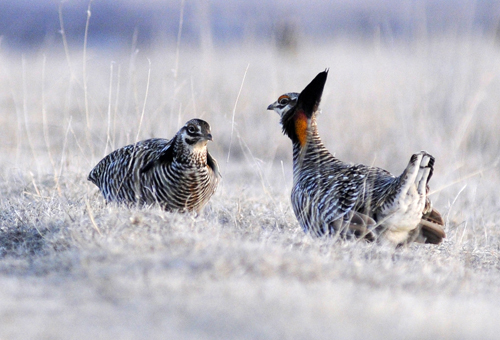 In contrast, the stubborn Prairie Chickens stay put, somehow surviving the bitter Great Plains winters. 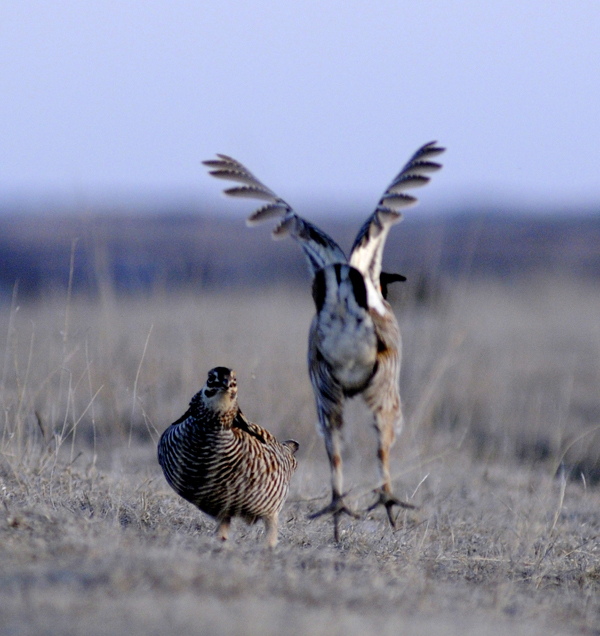 And then, of course, there’s the name – Sandhill Crane vs. Prairie Chicken?! How fair is that? However, this normally indistinct, fat, little ground bird puts on quite a production every March. And I had never seen it before. Like with the Sandhill Cranes, I had to move away from my home state to want to come back to witness it. 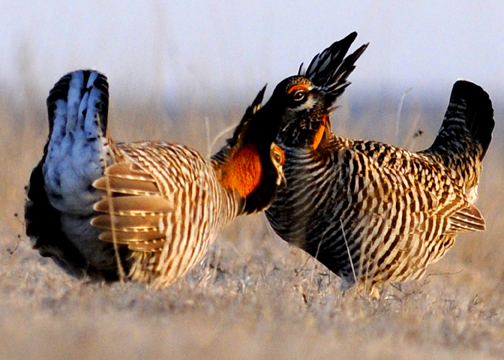 The Prairie Chickens have specific criteria for their stage ,which is known as their “booming territory”. They need a hill ridge with short grass that is at least a quarter of a mile from roads or power lines (not a problem in Nebraska). My dad knows which ridges on our farm are good viewing areas. So we put up a small camouflaged tent during the day in preparation for the sunset and then the sunrise performance. Mitch went that evening but didn’t have much luck. The prairie chickens congregated too far from the tent to get good photos and were spooked away by a hawk early on. The next morning, before morning really, I headed out on my own. Dad had told us that we should be in place and settled at least a half an hour before sunrise or sunset. So by 6:30 am, temperature of 14 degrees, I was making my way through the cold darkness to the tent on the top of the ridge. I crawled in the tent, situated myself with the blankets and my thermos of coffee, and waited…and waited. Frost formed on the part of the blanket that was covering my legs. My coffee was dwindling. And then I heard a noise – it almost sounded like a kazoo, a flutter of wings, and then another kazoo. Soon the kazoos surrounded the tent. The show was beginning. It was truly hilarious to watch and to hear. The Prairie Chickens started flying in from all directions. As soon as they landed, they looked around for someone to impress. Their “booming” is a three note song that sounds almost like a bamboo flute but then it is punctuated occasionally with a louder, monkey-sounding call. They inflate bright orange sacks at their throats as they are booming – the sacks are most inflated with the last note. As their necks inflate, these two crazy feathers rise up from behind their heads and look like rabbit ears and their tail feathers stick straight up. 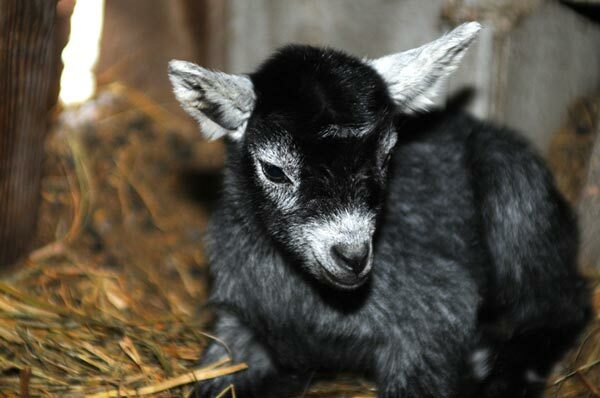 Then, when they are fully outfitted, they start to stamp their feet and sometimes take off running. While all of the males are trying to out-do each other, the females are off on the sides of the ridges, completely ignoring them. Mitch had to go out again that evening to see if they would land as close as they had for me. They did, and he got some great photos! 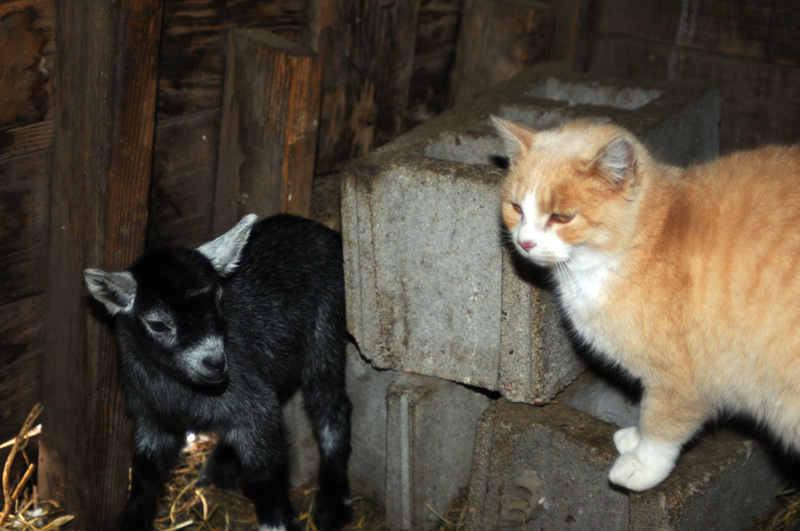 The goats had just had babies and Sunny the cat was jealous that they were getting more attention than she was. If they would only stay this size forever, Coastal Kayak would have a new mascot.